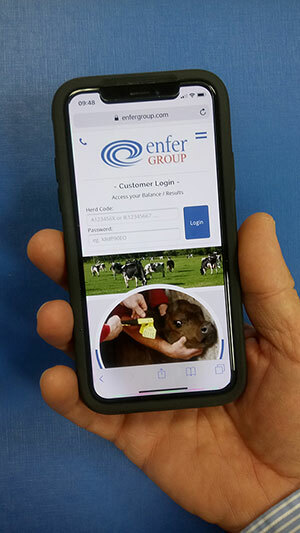 The Enfer Group is an Irish technology group of companies which provide a range of products and services to the veterinary diagnostic industry. Founded in 1990, the Enfer Group has grown from strength to strength over the past two decades with current R&D, production and quality systems operating from a 25,000 ft.² facility. Our mission is to develop and use the latest technology and the best science to give accurate, cost effective and rapid results in the veterinary diagnostic field. Enfer Labs was set up with the specific aim of providing a quality driven laboratory testing service to the agriculture and food sectors in Ireland and internationally. Operating to the ISO17025 quality standard, it is the largest private commercial veterinary laboratory in Ireland utilizing many unique systems and processes to deliver a high sample throughput with rapid results. Enfer strategically invests and maintains dedicated R&D project teams that ensure that our core mission is achieved. We operate from our Enfer R&D centre as well as various University based research collaboration partnerships both in Ireland and internationally. Our R&D teams are also involved in product development, delivering on-going enhancements based on customer feed back and our own experience operating large scale diagnostic laboratories. Enfer Scientific develops and manufactures its diagnostic kits in a state of the art production facility operating under strictly controlled quality and environmental conditions. Technical support and customer service are provided by a group of scientists and engineers that are highly skilled in all aspects of the Enfer assays and the primary equipment used to carry out the tests. They also provide on-site equipment set-up, training and demonstrations to new and potential customers. Enfer prides itself in providing a world class product, a superior service and technical support.